In the words of Perry and Bing and may other crooners, it’s beginning to look a lot like Christmas. Our tree went up at the weekend and suddenly the house feels transformed into a magical, sparkly wonderland. It’s the earliest we’ve ever put it up. My husband doesn’t think we should have a tree until Christmas Eve, but I’ve been working on him over the years and, having been to the children’s school Christmas fair the day before, it just felt right for it to go up last Saturday. We also made these After Eight ice cream sundaes at the weekend, which got us into the festive feasting spirit. Wow – they were good. Indulgent, rich and decadent, just like a proper sundae should be. Not of course, something you should eat every day though. But for a Christmas treat, these are just the ticket. I must admit, I haven’t eaten After Eight Mints for some years. I associate them with Christmas as a child back in the eighties. I can clearly remember being at my grandparents’ house in Lancashire for Christmas and having them at the end of a meal. As the grown ups were chatting, I pretty much worked my way through the box, and I couldn’t deny how many I’d eaten as the evidence was there in front of me in the form of a pile of those little black envelopes. I’d forgotten how much I like them. And my children seem rather partial to them to. It was a battle keeping the grubby little mitts off them so that I had enough to make this dessert. The good people at After Eight sent me some of their goodies to experiment with: a box of After Eight Mints and their After Eight Collection, a selection of dark and white mint chocolates. The challenge was to come up with a dessert featuring their chocolate mints. As my children adore mint choc chip ice cream, an ice cream sundae was the obvious choice. 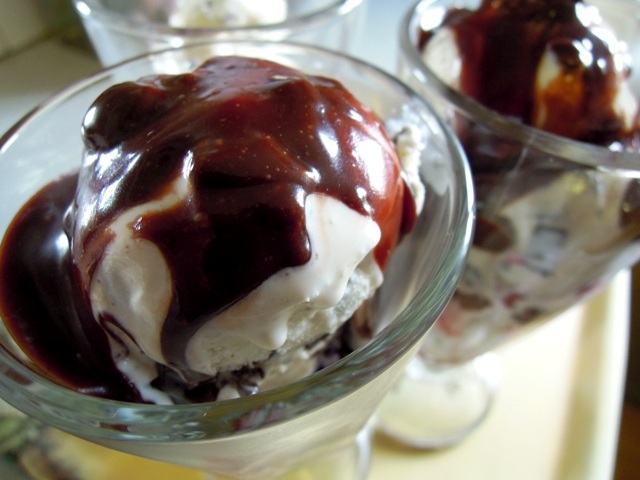 These sundaes are very simple to make; more of an assembly job really. There are chocolate brownies at the bottom. Feel free to bake your own, but I made things easy on myself by buying some. Next comes a layer of forest fruits, which bring a touch of tartness to the proceedings. You need it to cut through all that rich sweetness. Then there’s the After Eight ice cream. Even if you don’t fancy making the whole sundae, do try making the ice cream – it’s a lovely take on the classic mint choc chip and really couldn’t be easier to create. Melted After Eight Mints combined with a little cream conjure up a wonderful chocolate sauce, which is loving drizzled over the ice cream before topping with whipped cream for that extra level of indulgence. 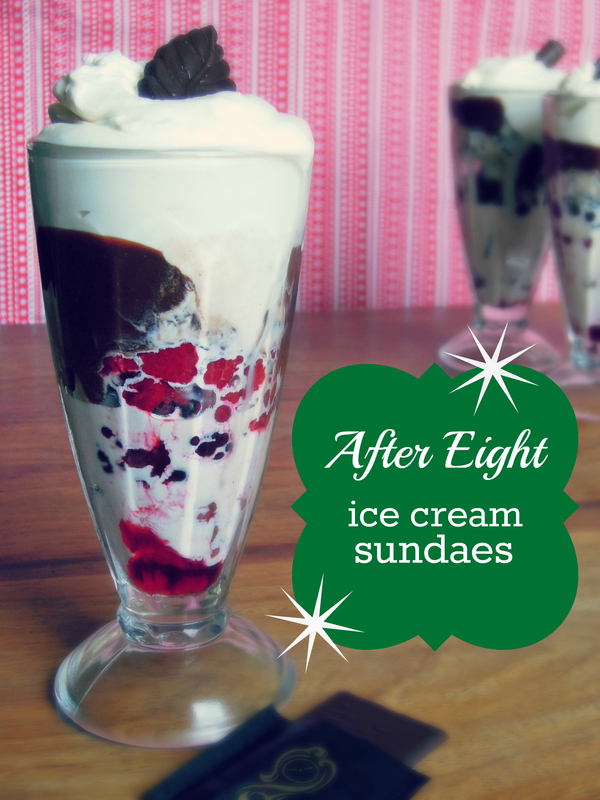 So there you have it – my simple After Eight ice cream sundaes. You’re welcome! 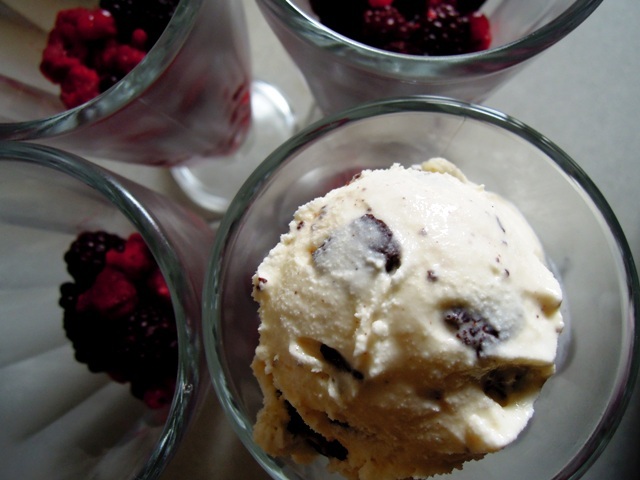 Place the ice cream in a bowl and allow to soften at room temperature for about 10 minutes. Chop half the After Eight Mints into small pieces. Fold the mint pieces into the ice cream, spoon into a plastic carton, cover and place in the freezer until it has re-frozen. To make the sauce, place the remaining After Eight Mints and 100ml of the cream in a saucepan over a gentle heat. Stir until the chocolate mints have completely melted and the sauce has formed. Leave to cool. Whip the remaining cream in a large bowl until stiff. Place the brownie pieces at the bottom of four sundae glasses and top with a couple of spoonfuls of the frozen fruits. On top of the fruits place a couple of scoops of the chocolate mint ice cream and drizzle with a generous smothering of chocolate mint sauce. 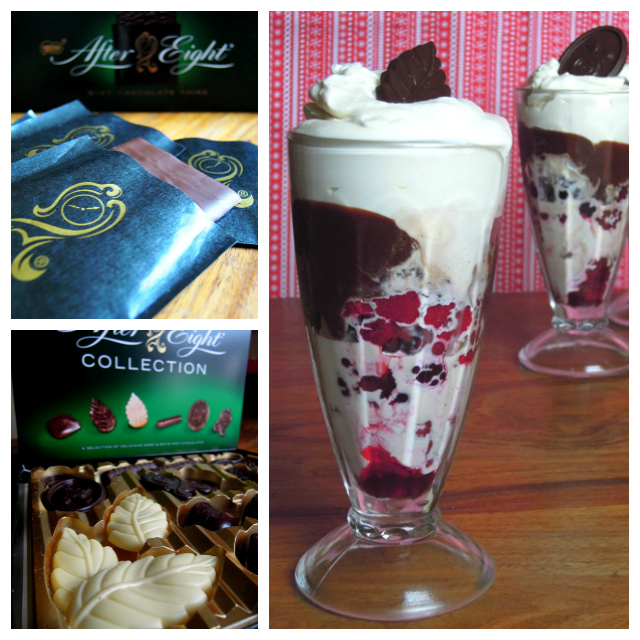 Finally, spoon whipped cream on top of each sundae and decorate with a pretty chocolate from the After Eight Collection. Dig in and enjoy to your heart’s content! Disclosure: this post is sponsored by After Eight who paid me to develop this recipe and provided me with complimentary boxes of After Eight Mints and the After Eight Collection. As this pudding definitely fits the description of a Festive Treat, I’m entering it into December’s Teatime Treats hosted by What Kate Baked and Lavender & Lovage. And these sundaes would be great for parties, so I’m also entering them into Four Seasons Food hosted by Delicieux and Eat Your Veg. My children adored the sundaes, so I reckon they would also make a good entry for December’s Family Foodies challenge over at Eat Your Veg, where the theme is Kids Christmas. Thanks Karen. I did think of adding a choccie mousse layer too, but I thought that might be a step too far! Your little mousses look divine, and I adore how you’ve served them in your vintage china. Just stunning. Oooh these look good, my children would love these! How do I decide between these and Karen’s mint chocolate mousses?! Both maybe…. Thanks Anna! Tough call – perhaps you could add a layer of mint chocolate mousse and combine both into a single dessert?! Thanks Deena. I used to love ice cream sundaes when I was a kid. My favourite treat for birthdays was to go to Ed’s Diner in Leicester Square for burgers followed by sundaes and would wasting all my coins in the mini juke boxes!